How do you remove the window cranks in a GTE? 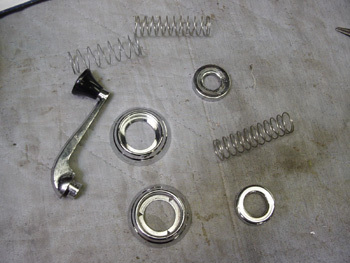 I checked out Tom's post on from when he installed the cranks in his 330, but I can't seem to locate the key to remove mine. It has been a long time since I did mine, but I remember there is a woodruff key (small half circle piece of metal) that has to be removed. I believe that you push in on the escutcheon, which will expose the key. Once you pull this out, it all comes apart. If someone else remembers this differently, chime in! First make sure you have all the same parts as a regular GTE. There should be a crank, a inverted cup, an escutcheon, a spring, and a little clip. Here's the post you were probably looking for. Wow, 14 years ago! I can't push the escutcheon in at all on the side where the key should be, it will push in on the rest of its circumference. Either I have different cranks, or the key has slipped partially out (I think its the later) preventing its removal. I've had them where they were very tight hard to move. If the key moved out of position, it would have let the window crank loose if it's the stock key. You may need to get a pick tool to push against the escutcheon a little harder. The key may be in the way. Sometimes with some jiggling, and some applied pressure, it'll let go, just be prepared to catch all the parts as the spring releases and everything shoots across the garage!